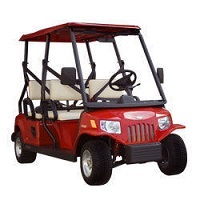 4 Seat Golf Cart 24 Hour Rental. *Based on availability at time of booking. Booking is complete only upon the execution by all parties of the contract agreement and receipt of payment for the vendor's reservation deposit. The Non-refundable reservation deposit/retainer is equal to 50% the vendor service fee. An additional travel fee may be required if your venue is out of area.